Tim brings all his Vedic experience and knowledge very practically together in the kitchen. From the cooking of simple quick meals we learn how to 'spice up our life' and discover greater richness in living our life. Ghee is one of the most valuable foods and medicines known, according to the texts of Ayurveda. It is the preferred cooking oil (it should not raise cholesterol levels, some studies show it can help lower cholesterol by aiding the digestion of fats, unless already there is a history of high cholesterol). Ghee may be used in place of butter. -Improves intelligence and mental functions, strengthen brain tissue. It is the best cooking oil, taking high heat without burning. 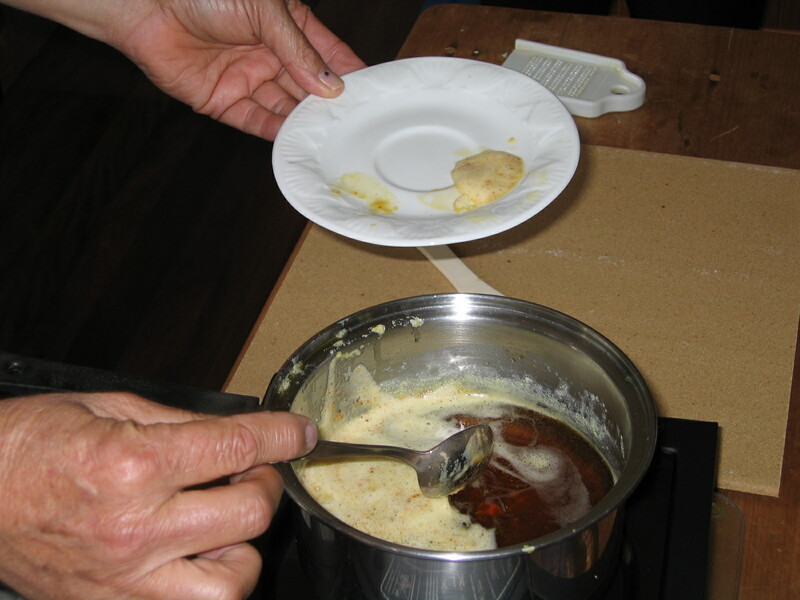 Ghee is good for all doshas in differing amounts, and is a specific for Pitta. Ghee keeps indefinitely without refrigeration, in fact it is best kept out of the fridge. Commercial ghee is now readily available at all Indian stores and these days many supermarkets and health stores are now stocking organic grass fed cow ghee too. However, there is nothing like your own ghee. The flavour and the quality is better. And the energetics of the ritual involved will impart a subtle, yet profound effect to your food that others will not miss. Sing while cooking it. 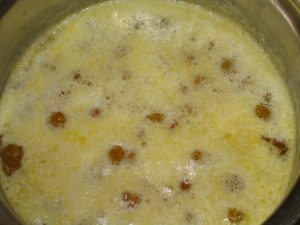 Many people consider Ghee making to be a Sacred Ritual, and so give the process their full attention, enlivening its finest and fullest value. Love it and it will love you. 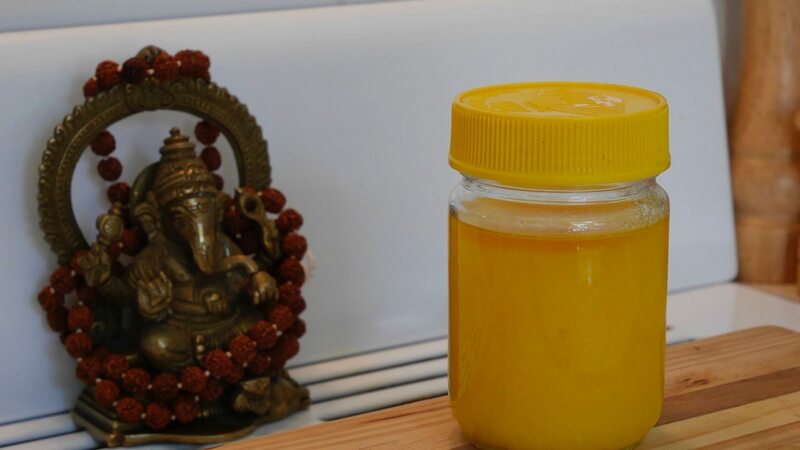 Ghee is considered to manifest all the qualities of Pure Gold. Take 500g unsalted organic butter and place in a heavy bottomed saucepan, preferably stainless steel , glass or ceramic. Over gentle heat, melt the butter, and then continue cooking over moderate heat so the butter boils gently. Foam will rise to the surface. This can be skimmed off but this will settle to the bottom in the process anyway. (Many consider it better to leave it to settle for medicinal qualities it imparts to the ghee). Continue to stir gently to prevent burning, while cooking for fifteen or twenty minutes, and you will notice a coating forming on the bottom of the pan and the foaming will die down. Careful attention is needed at this point, so turn the heat down, otherwise it could burn and ruin the taste and therefore the quality of the ghee. You should watch for all foaming to crease, the ghee boiling silently with only a trace of bubbles, the colour is pure gold, and just as it is done a rich unmistakable caramel aroma arises, and it is done. Another test is to put a wine glass over the ghee and if no steam/frost appears on the glass it is done. Allow to cool and then strain through several layers of cheesecloth, or a fine sieve carefully into a clean (warmed) jar, making sure that the sticky sediment (cooked milk solids) remains on the bottom of the pot. This sediment can be mixed with brown sugar for a nice toast spread if made with unsalted butter (if salted, discard the sediment). 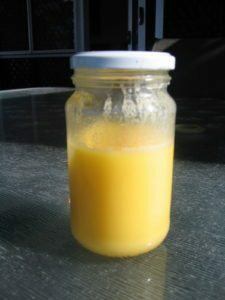 Ghee will solidify at room temperature. In India there are special medically prepared ghee’s that are over one hundred years old. Come, come with me to the kitchen, and I will show you something precious, so precious it will deeply enrich your life, diseases will avoid you, your thinking and vision will be clearer, the pains of old age will desert you and when you cook you will be worshipped as Mother Divine Herself ….. I am going to make ghee. Come, follow me…..
Ayurveda, the art of living and science of healing from the ancient land of India sings the praises of ghee both as a food and a supreme medicinal. It comes from the same roots as Yoga, and like yoga seeks to guide us with a simple yet profound inspiration –Whatever you are doing, do that! Consider this: If we take a sentence from any language and remove the spaces between the words, what do we get? It’s a jumble right? There is meaning there but its confused, not clear. The meaning comes from the empty space between. Sometimes our lives feel like that don’t they? Our actions and activities on our lives are the words of the sentence of our days. If we do not have gaps between them we too can feel confused in our day. A simple way to do this, a technique from Yoga, is to stop before finishing one thing and beginning another, and take a deep breath and let it out with a sigh (a long exhale). Try it now. Take a full deep inhale and ahhhhhhhhhh let it out easily and audibly with a sigh. How do you feel now? Different than before, a little perhaps. More quiet, more present. Simple huh! Try doing this when you jump into the car before you drive away. When you sit at the computer before you begin, and when you finish one task and before the next one. We spontaneously sigh when we have an overload of experience, and it helps the brain relax and process the input from the senses. This little technique we can use consciously to prepare us for the next task. It creates little gaps between our events so we do not lose the rhythm of the day. ‘Eat what you relish but chew it well’. Now it really means something. These are wise words from Maharishi Mahesh Yogi, who among many other achievements helped inspire a revival of Ayurveda in the West and in India Herself. So here we are in the kitchen so before we begin, a deep breath and long gentle sigh. There, a clean and tidy kitchen it is too, a designer kitchen and at great expense I have no doubt. It is my friend’s house, I am caring for it while they are away. But I can make my ghee anywhere, even when outdoors camping. In fact in India it is said that the best ghee, and medicines, are cooked on a yellow flame. ‘But surely heat is heat?’ I questioned the vaidya. ‘From a vitamin C tablet you get nutrient but from an orange you get nourishment. Like this a gas (blue) flame has only the kilo joules (energy) but has had its nourishment stripped”. When I told this story in Prague one winter a student came to me afterwards and said when ever he has to use gas instead of wood in the central heating system (that heats water that is piped to radiators thru out the house) it never feels as warm although the thermometer says the same temperature. Indeed we all know how an open fire nourishes us while an electric radiator merely warms us. But I digress. Lets find a good stainless steel, or even a pyrex glass small saucepan. A heavy bottomed one is best. Avoid aluminum pots, but surely we have all throw them out long ago. In ancient days we would have had clay or ceramic one to put on the coals after the meal was finished. 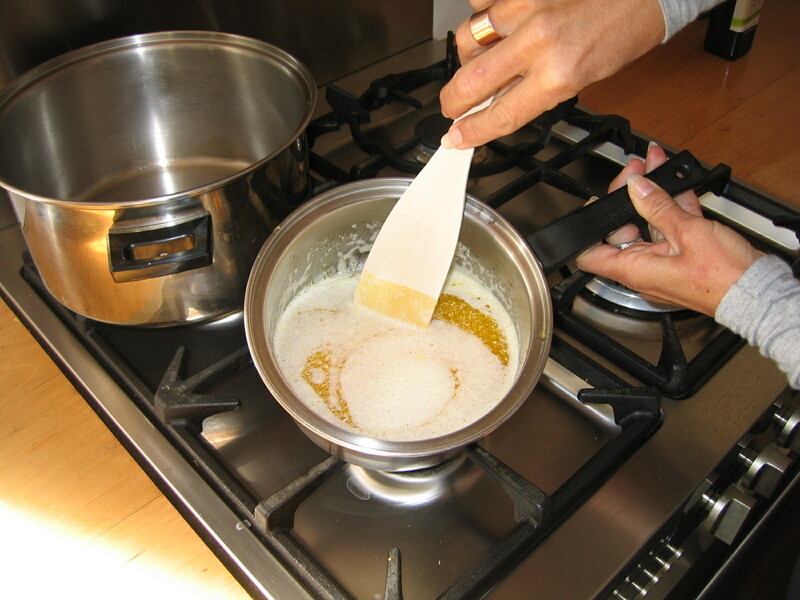 We do not need much equipment to make ghee: a saucepan, and small piece of cheesecloth or muslin, and a clean jar. And I always travel with a piece of ghee cloth! So, to the fridge for the one pound (500 gm) of unsalted organic butter, if possible, and from grass fed and happy cows. My colleague, Dr Shaun Matthews (a GP in Sydney who nourishes his patients with Ayurveda in his practice), tells a story of finding ‘the best lassi in India’ at a roadside stall. (lassi is drink made of fresh yoghurt and water, sometimes sweet, sometimes salty). On questioning the man on what his secret was, after much praise, he was invited into the simple hut behind the stall, but to his surprise as he was expecting to go to the kitchen, he was led outside to the back yard and the lassi-wallah pointed lovingly to his cow. ‘Lakshmi, she is my secret’ he said with the characteristic Indian head tilting. Grass fed cows produce butter that is a rich yellow color, grain fed cows make a whiter butter (like in the USA). In many places around the world now ‘Farmers Markets’ are appearing on weekends where you can buy fresh produce from the people who make them. To shake the hand of the man who churned the cream to make the butter, and knows his cows by name, is wonderful indeed. And we should support these markets, and not the supermarket chains who wish to dominate and then dictate what we shall eat. They already dictate what their farmer suppliers grow and the price they get. Do you know what is the most political act that we all do? It is certainly NOT the little tick or cross on the ballot paper every four or so years, this makes very little difference, usually, to the reality of our lives. It is how and on what we spent our money every day that votes for the world we want in the future, for our children. We buy the future we want by our spending today! Ah, I have been distracted again, lets get that butter my friends left for me from their local market. Look, now this is a healthy fridge. It is clean, with some empty space within it. Vegetables, still brightly colored and crisp in the bottom drawers, some fresh ricotta and some unhomogenised milk (probably from the same market man), and only few, but not too many, chutneys and other preserved or produced products. In the freezer there is probably a small amount of organic chicken, or fish. Although I am vegetarian, my friends are not, but they wisely use meat as a flavoring rather than a staple as most traditional cultures do (as pointed out my Michael Pollan in his ‘Food Rules’). I can tell the digestive health of someone by the state and contents of their fridge, in the same way as a vaidya can by taking your pulse, a TCM practitioner by your tongue or a naturopath by your eyes. I once found in the back of a friends fridge a tin that was ten years passed its use by date! And we all know fridges, have you got one, that is stuffed full of food, much of it old, and many opened jars and bottles of sauces and things…..a sure sign of chronic constipation. Friends frantically clean their fridges now before I arrive or steer me away on an unexpected visit. But anyway, here is the butter so lets go to the stove. If you have a heat diffuser to put under the saucepan that is nice but at any rate just use low heat and put the butter in to slowly melt. If we are being attentive we can increase the heat to bring it to a boil quickly then lower it again. Attentiveness is very important on obvious and subtle levels. A friend I was staying with recently got to this stage and then turned to the fridge and looking inside noticed that the bread was finished and went to happily to the shop. Alas I was at the river nearby enjoying my morning yoga posture practice. When I returned the street was full of uniformed burly men in red, and fire-trucks and hoses, and a small crowd of neighbors and my very distressed friend. Luckily we lost only the kitchen but it was months before all was cleaned and settled and she could move in again. Ghee when eaten or cooked with stimulates our digestive fire but it happily burns outside our stomach. All the temples of India burn lamps fueled by ghee. So be attentive! On a subtle level it is wonderful to remain very present while cooking ghee. Sing your favorite song from childhood or your sweetest bhajan (a devotional song praising the qualities of the Totality) while you occasionally stir the quietly bubbling pot. A delightful tip is to put a small pinch of turmeric in with the melted butter at this stage. This infuses all the many great qualities of the super spice into the ghee, making it a true medicinal. Some say stir it, some recommend not touching it all until done and some say scoop the froth off while others say do not. If your grandmother made ghee then listen to her (that is honoring an oral tradition) but otherwise find what works best for you. Having made ghee all over the world, I have found that different butters from different regions act in different ways. Some are frothy and need stirring to stop overflowing the pot (and starting a fire!) and others sit happily boiling gently. What we are doing in making ghee is boiling out the water content of butter (about 20%) and allowing the milk lactose (sugars) to separate, collect and roast slightly at the bottom of the pot. At this stage the liquid will be an opaque yellow fluid with sediment on the top and perhaps some white solids on the bottom of the pan. Keep singing. Ayurveda is very clear that the thoughts and intentions of the cook influence the energetic quality of the food. If you do not believe this, then explain why your Grandmothers Rice Pudding was, and perhaps is, the best in your world. When I go out with friends, while they are checking out the menu’s I am asking the waiter what is it like to work there, and does the chef love his job. Why pay for the indigestion of an unhappy man? Ghee is something you will use with every meal, perhaps. So keep singing and gently bringing the mind back to happy thoughts. You see now, after about 15 – 20 minutes, that the foaming has settled down and the liquid is becoming quite clear and golden in color. There maybe a little froth or sediment on top but clearly on the bottom a pale sediment is forming and beginning to go a tan or brown color. Only tiny bubbles will be coming this. It is close to finished. Bend closer and have a smell. When it is done there is a distinct rich caramel smell as the lactose sugars roast. Sometimes it fills he kitchen. Another test is to hold a wine glass over the surface and check for condensation, the faintest white mist, on the glass. If there is none all the water have been evaporated and it is ready. Now take it off the flame or heat and allow it to cool a while. 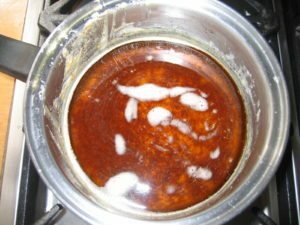 If the residue on the bottom is looking very dark then quickly put the pot into some shallow water in the sink to take the heat out and stop the cooking process quickly. Have a clean ceramic or glass jar ready but I remind you to allow the ghee to cool. If you can put your hand on the side of the saucepan for a count of two or three, without screaming or wincing, it should be fine. Once, in a friends kitchen long ago, in my eagerness I poured the hot ghee into a glass jar, and it cracked! I can assure you that ghee spreads a long way and is very difficult to clean. Another tip is to put a metal spoon in the jar and pour onto it. So all that said we are ready to decanter it from the pot. 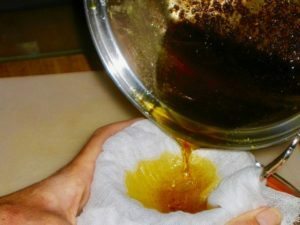 So stretch a piece of cheesecloth or muslin or a very fine metal strainer over the jar to filter the sediment as you pour. Look at that beautiful golden color. Ghee is said to manifest all the qualities of gold. Have you ever wondered why is considered precious in all cultures around the world? What is unique about it? It does not corrode. It remains pure and shiny. All other metals rust or oxidise in the air. Ghee is pure as gold. In ancient times the temples made ghee and kept it for one hundred years. As it ages it develops different qualities and is used as a medicine for different ailment. The hundred-year-old ghee was kept for the kings armies to use in times of war. It was the best first aid for sword and arrow wounds. One year old ghee is said to be very good for non chronic depression, taken with warm cows milk. When I was told this, in India, I asked the vaidya if would be good for post natal depression. He did not understand what I meant, asking ‘how could a mother be sad with a baby in her arms?’ Finally, as I explained the symptoms often experienced in our culture he agreed it would be good. So first make the ghee, then find the man and get pregnant girls! How long will it keep I am often asked? Well the previous tale tells us a hundred years but more realistically to make enough for a few weeks usage is good. It does not need to kept in the fridge, in fact is better left out, just by the stove. It will not go rancid as butter will as we have purified out all the elements that go off. When a mother is making ghee in India all the children start to be on their best behavior because the roasted lactose sugars, the sediment in the cloth after straining is mixed with a little jaggery (or brown sugar), popped in the fridge to cool and solidify, and it makes a small treat, like a piece of fudge, or put it straight on a piece of toast. But there is only enough for one, for the favorite or best kid. I am not so kind as a mother, and I keep it for myself, as the reward for the time and devotion to make ghee. But you will be worshiped enough anyway for you efforts. Your family’s digestion will be better as it enhance enzyme function, and ghee takes the nutrients from the food more easily and deeply to the tissues of the body. Your eyesight will be protected and the passing of the years will sit lightly on your shoulders. Diseases will pass by your door. Your children’s grades at school will improve, as it strengthens brain tissue and intelligence. It improves your voice and strengthens the kidneys. And your cooking will taste divine, with all flavors enhanced. Your guest will comment how they feel wonderful after eating with you. Really how can you afford to not make ghee and enjoy it daily. Professor P.H. Kulkarni, one of the Grandfather’s of Modern Ayurveda, of University of Pune said to me ‘If you want (to live) one hundred years have two teaspoon of ghee everyday’. I am going for that century. Come and experience freedom in the kitchen. Open the fridge door then decide what to cook. Cooking Techniques and Wisdom of Health that are practical and without dogma.